Fast and Furious 8 | No Chic. Just Geek. There comes a point during F Gary Gray’s Fast and Furious 8, possibly when the great Vin Diesel is jumping his car over a nuclear submarine in order to rid himself of the heat-seeking missile which someone has inconsiderately launched at him, when it is entirely reasonable for a person to forget that things were not always thus with this franchise. The last four or five installments have been such utterly reliable, if slightly ridiculous, big-scale entertainment, that you might assume that this is really an in-name-only sequel to the moderately gritty and down-to-earth 2001 progenitor of the series. This is about as good a hopping-on point for newcomers as any film in the series. As things get underway, man-mountain boy-racer and mastermind of good-hearted skulduggery Dom Toretto (Diesel) and his wife Letty (Michelle Rodriguez) are enjoying a postponed (since F&F4) honeymoon in Cuba. This involves Toretto launching burning cars into the harbour at supersonic speed, backwards, but romance is a personal thing, after all. Meanwhile, colossus of justice Hobbs (Dwayne Johnson) is enjoying a little down-time, until someone arrives to deliver some important exposition. Thus we get a scene where someone is trying to explain to Hobbs about a stolen doomsday weapon while he is distracted and trying to coach his daughter’s soccer team. Well, Hobbs retains Toretto and the rest of the F&F All-Stars to help him get the doomsday widget back, not realising Toretto has fallen under the sway of evil cyber-terrorist Cipher (Charlize Theron), who gets him to pinch the widget and zoom off with it, abandoning the rest of the All-Stars. But how is this possible? Given that Dom devotes most of his dialogue in these films to rumbling on about the importance of ‘fam-er-lee’, what could possibly make him sell out his nearest and dearest this way? Even Charlize Theron does pretty well with a character who is, on paper, not much more than an, um, cipher, much given to slightly preposterous speeches about evolutionary psychology and so on (clearly she’s yet another person who’s just read Sapiens). Given the size of some of the performances elsewhere in the movie (and the size of some of the performers, come to that), it’s hard to make a big impression as the bad guy in Fast and Furious Land, but she has a good go, helped by the fact that Cipher steers the series into some properly dark territory – something genuinely shocking and serious befalls a regular character partway through this film, threatening to tilt it all over into the realms of bad taste. The casual way in which the film recovers its absurd, freewheeling tone is just another sign of the genuine deftness and skill with which these films are made (although this one does seem to score a bit higher on the mindless slaughter scale than most of the others). I do get mocked for my sincere enthusiasm for this series, but it is simply supremely well-made entertainment, and if the combination of stunts, jokes, fighting, and sentimentality is a bit preposterous, so what? With the Bond movies seemingly locked in ‘glum’ mode for the duration, there’s a gap in the market for something so knowing and fun. At one point in this movie, Jason Statham launches himself into battle with a squad of goons, gun in one hand, baby-carrier in the other, and what follows is both a terrific action sequence and genuinely very funny, with all the craziness you’d hope for in one of Mr Statham’s own movies. I do hope they keep Deckard (and his own fam-er-lee) around for the next one. If Fast and Furious 8 is silly or ridiculous (and it really is), I would suggest it is silly and ridiculous in an entirely intentional way. And underlying all this is a script that regular writer Chris Morgan genuinely seems to have thought about – he doesn’t quite do his usual chronology-fu, but nevertheless he’s locked onto the fact that ever since the first one, the best of these films have all been about the camaraderie and sense of belonging you get from being part of a gang, or a family, and this informs the plot of this one in a fundamental way – that’s the thread linking the new film to the original one. Silly is not the same as stupid. 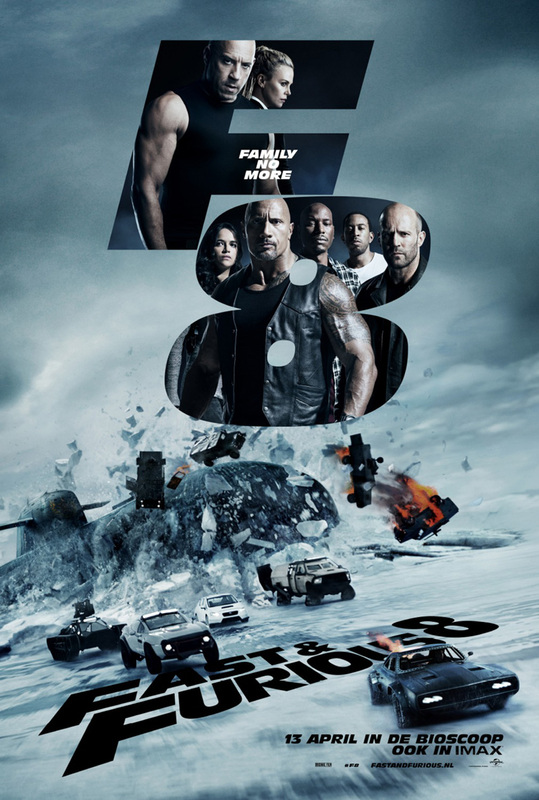 So I suppose it’s possible to genuinely dislike Fast and Furious 8, in the same way it’s possible to dislike any movie – but that doesn’t make it any less successful in hitting the targets it has set for itself, or indeed any less entertaining for the rest of us. If every film were made with this degree of skill and attention to detail, then the world would be a happier place.